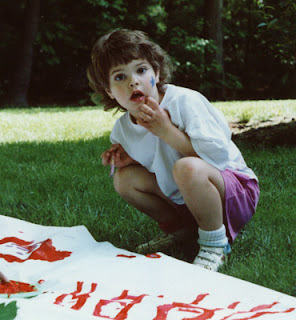 My special thanks go out to Michelle Vackar, from whom I first learned about the fact that you could make sidewalk chalk. I read through her directions, and then tried a couple of test batches myself in order to get an accurate measure using the specific type of plaster I had on hand. Mine is called ArtPlaster, and it is a much more finely milled powder than most that I've played with over the years. 1. 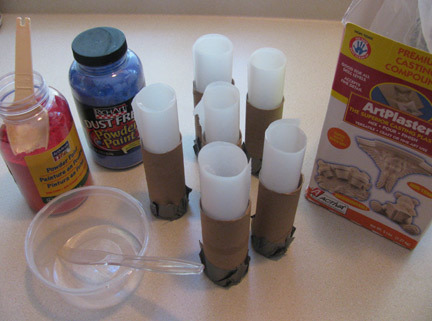 Prepare the tubes by sealing off the bottom with duct tape and lining them with waxed paper. 2. Place 1/3 c water into the disposable container. 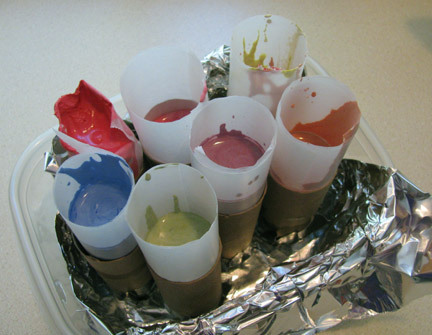 Add 1 to 2 T powdered tempera to create the color you wish. You can add a bit more later if you need to deepen the color. Stir well. 3. Sprinkle 2/3 c plaster over the colored water and stir well. 4. Pour the plaster into the prepared tube. Place the tube into the larger container to keep it from spilling. 5. Wipe out the container and move on to the next color. If you think about the color progression, working from light to dark, you won't have to worry too much about a bit of plaster being left over from prior batches. In fact, you can deliberately swirl colors together if you'd like. 6. Dispose of drying and hardened plaster by wiping it up with paper towels and placing in the garbage. I don't recommend rinsing too much of it down your sink! 7. 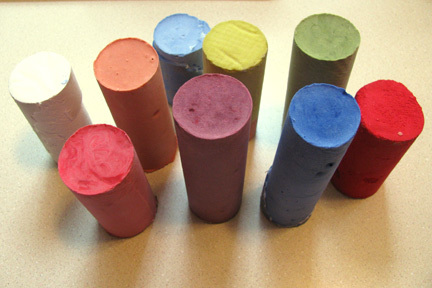 Allow the chalk to dry as long as needed. On a warm dry day it will take several hours, but won't really be rock hard until overnight. You can cheat a bit by using a medium or low setting on the microwave, but I recommend placing paper towels underneath the chalk to soak up the colored water that will run out. Be sure to show us some of the masterpieces created with the chalk! Thanks for sharing! I never realized you could do this. Very cool. I didn't either...and it's soooo easy! !